Nothing spared on this vegetable recipe, with bacon and everything. 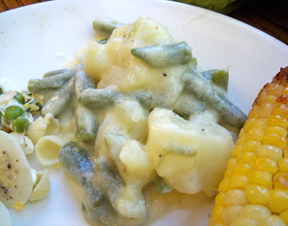 The green beans are sure to disappear quickly! Render bacon in an iron skillet, reserving the bacon. If using onion, fry in the bacon drippings in skillet. 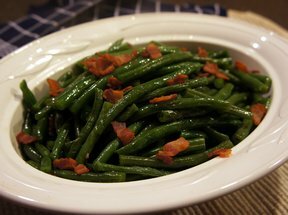 Add green beans to the skillet. 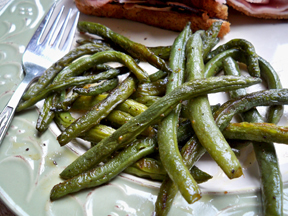 Add seasonings and enough water to almost cover green beans. Bring to a rolling boil then turn heat down to simmer for 8-10 minutes or until doneness you desire. Remove lid at the end of cooking time and cook down to a very low liquid. Serve with reserved bacon pieces. 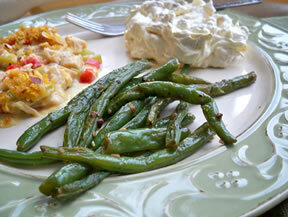 VARIATION: Add some diced country ham which makes this Southern dish even more delectable. "I barely had any left after they got done cooking because everyone was snatching them out of the pan. Could have something to do with the bacon bringing everyone to the kitchen :)"